This morning was shopping morning and first thing (well 9am) E (the baby) and I headed off to the market! I was pleasantly surprised to meet and chat with their produce buyer; Mr. A is what we’ll call him! I was asking him all sorts of questions; I am naïve in the produce buying dept and needed to be schooled. Mr. A taught me that grocers, like Ken’s, don’t buy directly from the growers… they buy from a wholesaler who buys from/deals with local producers. I was thinking small growers would come in, negotiate their prices and that is what Ken’s sold… but I was wrong (not the first and not the last time). Although Ken’s deals with a wholesaler here in MI, they pride (you could tell from how proud Mr. A was) that they bring in as much local produce as possible… produce grown RIGHT HERE in MI!! I was proud as well. Proud to call Ken’s our number one market!! As you have read from previous posts, we do most of our shopping at Ken’s. We did do some shopping at the Farmer’s market when it was here this past summer-early winter… however Ken’s was closer. We will be shifting a bit of our buying to mainly using the farmer’s market for produce come this May… but Ken’s WILL still be our main buying location for locally produced milk, cheeses, noodles, juices, etc. Ken’s will also be the place to go when we can’t make the market during the week and may be short some type of veggie, thank goodness Ken’s buys local produce when they can!! What else did I learn from Mr. A – Ken’s is relatively NEW… I got home and immediately asked my family, J and S, how long they thought Ken’s has been serving Alger Heights… J guessed 45 years, S guessed 6 years. They were shocked when I said 2 YEARS!!! 2 years?!?!?!?! Whoa, they run like a well oiled machine and they seem to have a great clientele. They have a facebook page, check them out – they are actually expanding to a new store ~15 miles north, by Sky’s school… even BETTER. • I usually use a whole chicken, today however we are doing the chicken leg/thigh ¼ pieces, they are 89₵ right now. Also buy 1 large leek, I believe they are $1.19/lb – and a large leek doesn’t weigh too much. Swing by their south wall with their “boxed” items and pick up a box of veggie stock made by Kitchen Basics. That is all you need to buy to make some great chicken. Slice your leek top and bottom off, slice lengthwise down the leek… rinse WELL, then cut into ½ – 1 inch pieces. 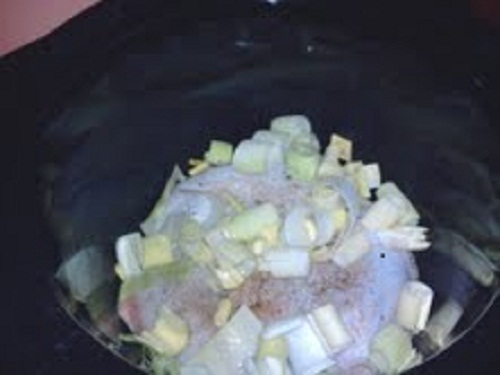 Put ½ of the pieces in the bottom of your crock pot (we are using a 4qt for the 3 chicken ¼ pieces I bought today) and put your chicken on top, skin side up – pour ~ 1/4 cup of your brother over the chicken. If you have spices lying around you want to use put a little on top, we used some white pepper (Ken’s doesn’t carry this – Meijer didn’t have it either – we found it in another state while my husband was traveling) and poultry seasoning, top with remaining leeks. Turn your crock pot on low and let it go for 4-6 hours (depends on how DONE you want your chicken) TADA… you made some yummy chicken. Use it as a salad topper, use it in a meal (like: Creamy chicken noodle soup – found in the recipe category) or eat it right then with a side of rice and a steamed veggie. ENJOY! !